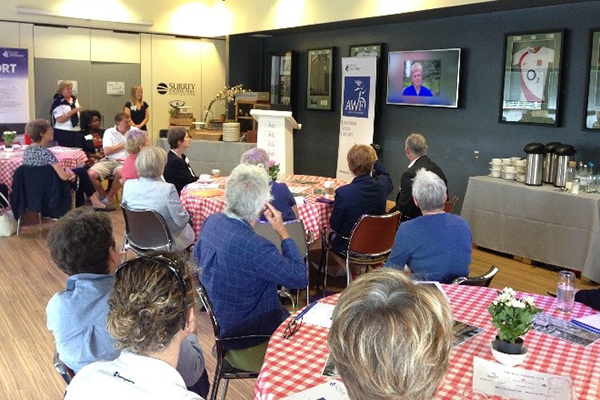 In July 2017, the AWF launched the first of two projects to further preserve the heritage of the Women and Sport Movement. Women and Sport: The ChangeMakers is dedicated to Professor Celia Brackenridge OBE. This website is an interactive digital resource, designed to make Celia’s life and work accessible to scholars and activists interested in women, sport and social change, and to inspire women sport leaders of the future. It summarises her achievements as a top class sportswoman, and as a founder of the Women’s Sports Foundation (UK), WomenSport International and Safe Sport International. Information about her extensive research is provided, with links to key references and publications. Her impact on national and international sport issues and policy is highlighted, with comments from colleagues and experts in the field. 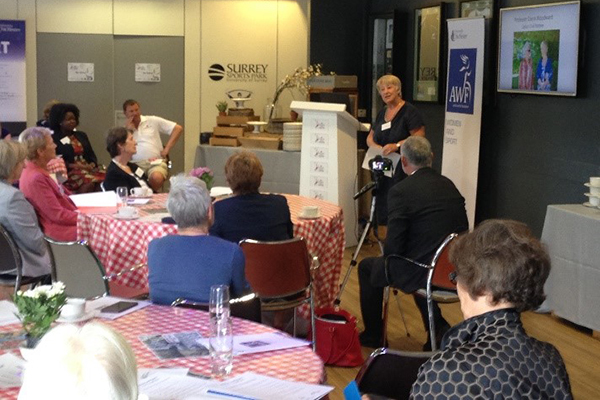 The event was hosted by English Lacrosse, the AWF and the University of Chichester at Surrey Sports Park, Guildford, to coincide with the Women’s Lacrosse World Cup – a sport for which Celia represented England for thirteen years and coached the national team to the 1986 World Cup. Mark Coups (CEO of English Lacrosse) opened the event by acknowledging that the sport holds a huge debt of gratitude to Celia. "Science and knowledge and educators are so crucial to the Women and Sport Movement. You have to have good science, it's no good being polemical or writing angry pieces in newspapers. If you provide the evidence, that is an unassailable position ... for the ideological changes we want to achieve". Professor Diana Woodward, Celia’s civil partner, closed the event by reading a letter from Celia outlining her pride that the website had been completed and thanked her friends and colleagues for their support with her work. Dr Mark Mason (Deputy Vice Chancellor of the University of Chichester) stated he was proud of the AWF and the University of Chichester for being at the forefront of the Women and Sport Movement to educate and develop the next generation of women and sport leaders, particularly bringing attention to the life and work of a preeminent sportswoman, scholar and activist such as Celia. The AWF, as part of the University of Chichester, has an ambition to develop the website into a resource that captures the work of activists and scholars who have helped shape today’s women and sport movement. We would be pleased to receive comments on the website and suggestions for its development.